A couple of weeks ago, I told you all about winning Best Decorating Blog in the Country Living Blue Ribbon Blogger Awards and my trip to New York City for the awards ceremony. Well....I was so excited when my mother called me last week to tell me she got her copy of Country Living Magazine in the mail last week, and I was on page 12! I was on pins and needles because I hadn't received my copy yet. So I drove my family crazy while I waited patiently for her to bring her copy over when she visited on Saturday. 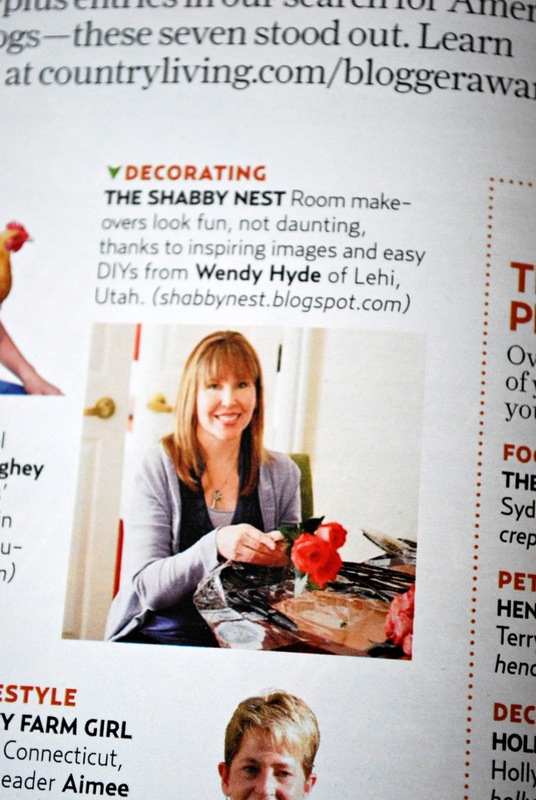 It was so exciting to open the magazine and see little old me featured in the pages of Country Living! I couldn't be more thrilled! 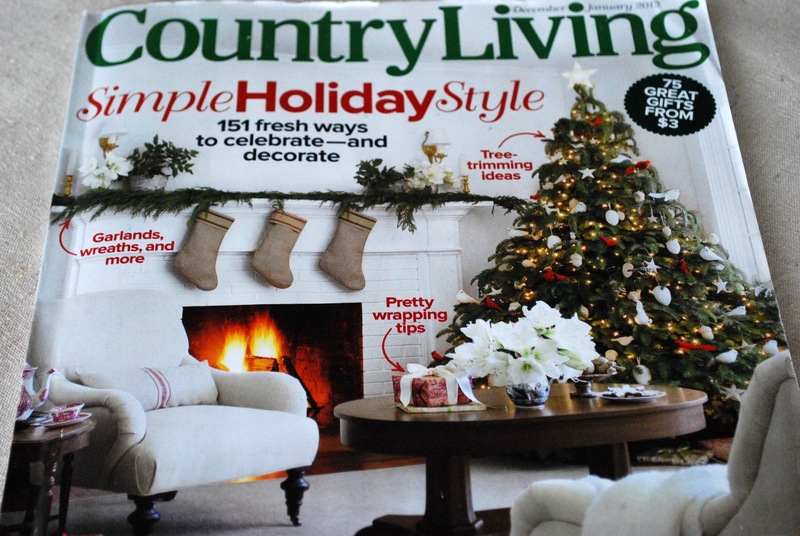 The magazine hits newstands on November 22. You bet I'll be there bright and early to pick up a copy (or 10). Thanks again Country Living for this honor. And thanks to my readers for making my blog such a happy place for me to be. Aw, congrats, Wendy! Yay! You look darling. Guess I better go get my copy today, huh? Congratulations! I just bought mine but haven't opened it yet. Can't wait to see you on page 12! Congrats! What a wonderful affirmation. Love your blog!!! Congrats! What a create achievement and affirmation of your talent. I just saw another advertisement for that magazine on Nate Berkus too. Thanks for sharing your joy with us. I love your blog. So fantastic! I don't usually get that magazine but just to see you I will on the way home today! Yayayayayay! Congratulations! I received my copy last week and saw your feature. That's awesome! My copy arrived Saturday. I was so surprised when I opened it and saw the page you are on. I said, Hey, I read her blog! How cool is that! Congratulations! Awesome, awesome, AWESOME!!! So happy for you - so very well-deserved. Congratulations! I saw your sweet pic when I looked through my copy over the weekend. So happy for you! Yay! Great stuff you! 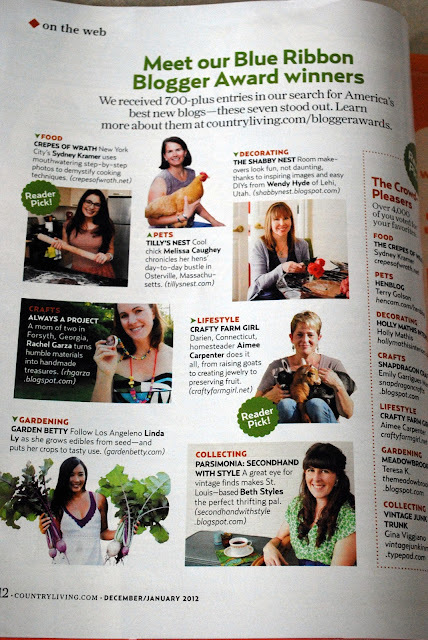 I think I would be insufferable if I was in a Magazine! Congratulations, what an honor, I'm so proud of you! Great job!!! Congrats! What a great accomplishment! I love your work and look forward to more! Congrats and your picture is beautiful..I have yet to get mine in the mail though..I have seen it in stores here last week..Crazy I know..I thought I was to get mine first..Oh well..I can't wait to get my copy and tell everyone that I blog with that lady..Congrats again..
Congratulations Wendy! What a wonderful honor. The picture is wonderful. I too would be scooping up a zillion copies. :-) CONGRATS & Happy Thanksgiving!!! I was enjoying peace and quiet after the kids went to bed Saturday night, and I opened up my new copy of CL, and there you were right in the front of the magazine! Yay for you! Congrats, you deserve all the recognition and more. It is truly a wonderful blog. Congratulations!!! You were famous to us now you are famous to them too!!!! when I saw the magazine last night I was so happy for you!!! YEAH!! congrats you deserve it!! Congratulations Wendy! You totally deserve it- I love and follow the blog daily.